Finely chop onion. Dice Gruyère cheese. Finely chop parsley and marjoram. Add butter to a frying pan over medium-low heat and let melt. Add onion and sauté until translucent, then remove from heat. 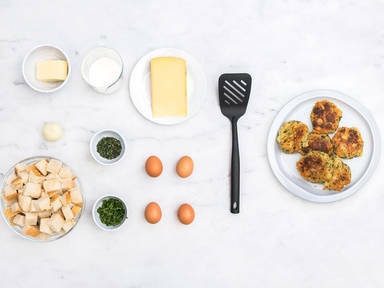 Add stale, cubed bread to a large bowl along with the milk, eggs, diced Gruyère cheese, chopped parsley and marjoram, and sautéed onions. Season with salt and pepper and mix until well combined. Use your hands to form the dumpling mixture into patties. Heat clarified butter in a large frying pan over medium heat. Add dumpling patties, working in batches so that the pan is not overcrowded, and fry approx. 4 min. on either side, or until golden. Serve dumplings in broth or with a side salad. Enjoy!